Mud flats, originally uploaded by Zardoz67. Earlier this week I deliberated quite hard about which picture I should blog next. I am really pleased with some of my landscapes from Thurstaton beach on the Dee Estuary from a couple of weekends ago (of which this is one) but want to break things up a bit. I am very aware that I am in danger of focussing primarily on landscapes, which is not a bad thing as most photographers specialize, but this is not going to help me develop my skills. I would love to take some more portraits but need to find some willing victims; you can’t just take pictures of complete strangers and stick them on the Internet without getting some sort of consent. But I digress (yet again)… Anyway, I thought the face paint picture was quite cute and different to what I have posted of late so decided to go with that one. This is the point at which things went a bit mental. First, was an e-mail from one of the Editors at WordPress (thanks guys!) saying that they had decided to feature my blog post on the site’s front page; in other words that they had chosen to highlight my blog of the hundreds of thousands of others, many of which are far more witty, insightful, campaigning, and intelligent then this will probably ever be. What their criteria for choosing is I don’t know; I’d like to think that it’s not a random process and that it wasn’t simply ‘my turn’ and I like to kid myself that maybe someone really liked the picture or what I wrote or both. I’ll probably never know but thanks anyway. One of the great things about WordPress is that it provides the blogger with statistics showing how many unique views a particular post has had each day. Recently, I got very excited when almost 100 people read my blog in one day. However, following appearing on the WordPress front page I experienced 4595 unique views in the 24-hour period that my post was centre stage. Not only does has this demonstrated the power of WordPress to me it has also demonstrated that most human beings, wherever they live or what whatever their background are genuine, kind and supportive. I have had comments from all corners of the world that have been warm, supportive and generous and I thank you all! Again, you have proved to me that perhaps I do have a talent for this and that is worth persevering. How many of these people will come back though is the more interesting proposition. I have no idea how many of those people have bookmarked this blog or added it to their blogroll. If you have I thank you! And if you let me know I will endeavour to do the same. Interestingly, many of the comments were from people of a similar age to me who have also taken up photography relatively late. This set me wondering as to why that is and I can only conclude that it’s only when we reach our later 30s and early 40s that we start to feel comfortable in our own skin. Maybe by this time we have done the things we are supposed to do be it get married/find a partner, have kids, travel the world, realise that work is a means to an end and that sometimes its actually a relief to let go of the greasy pole of career and ambition. Some things in life are more important. Health. Happiness. Love. Friendship. I used to beat myself up about why is was that I it had taken me so long to find photography as a hobby but I think the truth is that I wasn’t ready for it; also, if another truth be told, there was no such thing as digital photography and traditional darkroom photography was a mystical art. At the age of 42 I think I have finally worked out who I am, what I am good at and what my limitations are and once you have worked this out you can relax a bit. The world at the moment is a pretty scary place. My 9-year old son (despite his interest in all things army related) is very aware of the wars in Afghanistan and in Iraq and they upset him. My daughter is the ‘eco warrior’ for her class at school and is constantly berating me for ‘killing polar bears’ if I leave a light on. The earthquake in Haiti has reminded us all of the fragility of human life. But, at the same time, the world is a beautiful, amazing place full primarily of ordinary decent, honest human beings who do not (in the main) make judgements based on skin-colour, accent, dress sense or hairstyle. You know these people – they are your friends, neighbours and work colleagues. 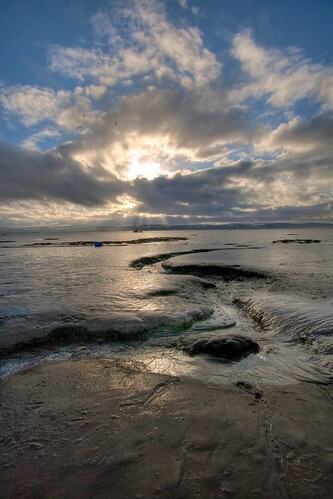 Today’s picture is a seascape taken on the mudflats of Thurstaton on the Dee Estuary, The Wirral, England, UK. I think it’s beautiful. I hope you do to. This entry was posted on Wednesday, February 10th, 2010 at 11:04 am	and tagged with beach, clouds, Digital, landscape, nature, Photography, Places, seaside, water, wide-angle, Winter and posted in Photography, Places. You can follow any responses to this entry through the RSS 2.0 feed. Hi again. I’m one of the thousands who looked at your last post (makeover madness) and I DID bookmark your blog so I can visit regularly. I genuinely do like your work. I shoot portraits mostly, and Have always wanted to do more landscape work, so it’s nice to see your images. Inspirational! I, too, viewed your blog for the first time from the front page. The photo of your daughter was captivating for several reasons. I liked the colors, the smooth, plainness (word?) of her cheek against the intricacy of the tattoo, and for the missing parts, too. I will be 42 in a couple of months and agree whole heartedly with your observations. It takes years for us to realize that we’ve been ourselves all along. No longer do I feel the need to apologize for my perspective – it is mine and I own it robustly! Writing is something I’ve dabbled with my entire life and I am just now in a place where I feel I have the time and the confidence to make use of my talents. Photography is the next layer I will be adding to this ‘hobby’. I start with an introductory course this spring. I’ll keep checking on your progress. Thanks for the inpsiration. Thanks Nina! Glad you like the blog and that you can take inspiration from it. Unlike with your writing I only started dabbling with photography recently. I like being able to capture perfect moments and documenting beauty. I wish the 42-year-old me could talk to the 18-year-old me and let him know how things turn out. Confidence came quite late for me but hopefully making up for it now. lovely blog. spent a great time looking a your astonishingly beautiful landscapes..